Celebrate any occasion with the Cub gift card that fills their pantry with tasty foods for weeks to come. Cub Foods now has their very own grocery pickup and delivery app that is sure to make the Cub gift card all that more special. Cub Foods also has over 200 varieties of organic fruits and vegetables, new BBQ Grill Kits, and everything else you will need for this season. 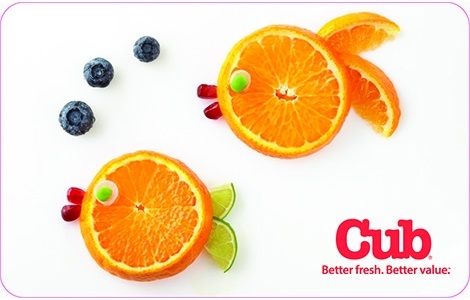 With 78 locations to choose from, everyone will enjoy the convenience and variety of a Cub gift card! National Gift Card is the best place to order Cub gift cards in bulk. We are the experts in all things gift cards and can set up your gift card solutions program for you today. Please contact us for more information on Cub's bulk, direct-to-recipient, or individual gift card fulfillment for your gift card program. Contact us online or call us at 888-472-8747 today! This gift card is available in any amount from $5 to $500. This gift card can be used for merchandise purchases at any of the stores listed on this card. Card may be used multiple times until value is fully depleted. Card cannot be redeemed for case except where required by law. SUPERVALU is not responsible for the use of your card without your knowledge. Lost or stolen cards will not be replaced. For card balance, call 1-877-932-7948 ©2016 SUPERVALU INC. All rights reserved. All proprietary trademarks are owned by SUPERVALU INC. or its subsidiaries.